Turns out my daughter in law knows a thing or two about oil-based paint. So we discussed and decided that my paint was too thick. Today I poured a little paint into a container and added a few metric glugs of thinner. I mixed it all up, seemed legit. 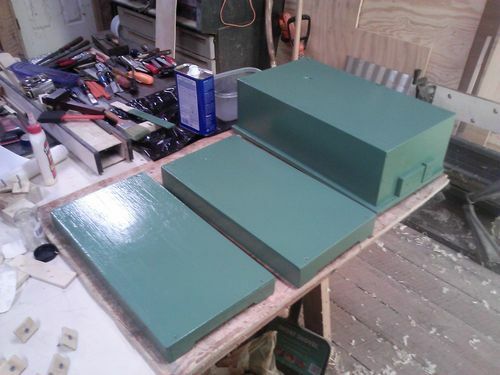 I decided that I would work on the outside of the boxes and finish the insides later. The thinned paint went on pretty smoothly. I am sure that it was being applied to a painted surface and not raw wood helped too. And here’s the old box on the new box. The colors are more closely matched than it seems from these images. The new paint is a semi-gloss which makes a direct comparison tricky. Tomorrow I’ll probably finish the outsides. There could be some light sanding and touch-up here and there. 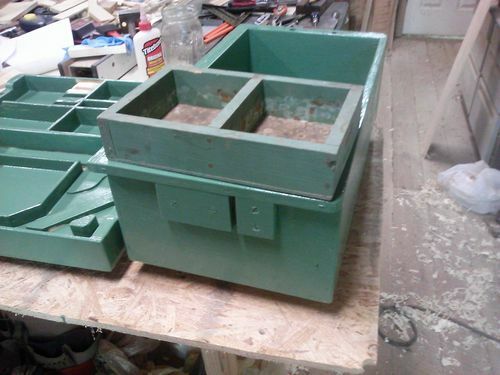 This toolbox is for the barn and will be stocked from the Land of the Misfit Tools. It doesn’t have to be perfect.